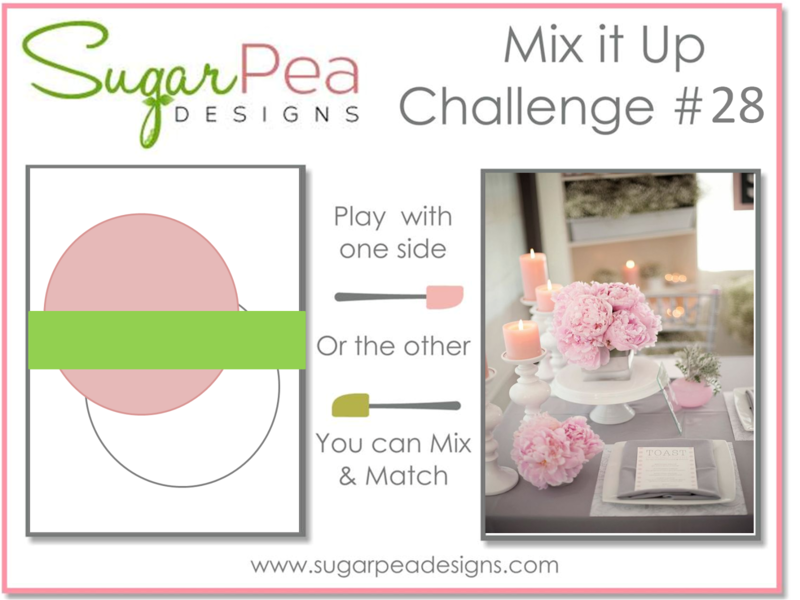 After a short night sleep I am here again, sharing a card I made for the Sugar Pea Designs Mix it up Challenge #28 where the theme is lots of love. I started with cutting a lovely Doodlebug paper to an A2 size with a die from MFT Blueprint 25. Then I cut 2 scalloped stitched circles (MFT), a bigger from light pink cardstock and a smaller from light grey to hold the sentiment. I also “built” a farm fence (MFT) from white cardstock, it took a bit of time to layer it all, but it is totally worth it, look at the dimension! When the arrangement was all done, I stamped the mama bunny from the SPD set, coloured with Shinhan alcohol markers and fussy cut it with scissors. I always prefer to have coordinating dies, but running the tip of a Memento Black marker on the cut edges helped to finish off the image nicely. The little imperfections due to fussy cutting disappear in this way. I mounted the bunnies with foam tape and added some details with a white gel pen, used black glaze pen on their eyes, some Spectrum Noir shimmer pen and glossy accents on the dress and flowers. A few clear sequins from SSS and Pretty Pink Posh finished the card. The love of family is a really our greatest blessing and I am forever grateful for this. I think this card will sit on the shelf in our living room. I hope you like it and got inspired. I will also upload this card as my last (5th) entry to the Simon Says Stamp Wednesday Challenge Anything goes. I am back again with a card I made today afternoon while my sick little ones had a healing nap. 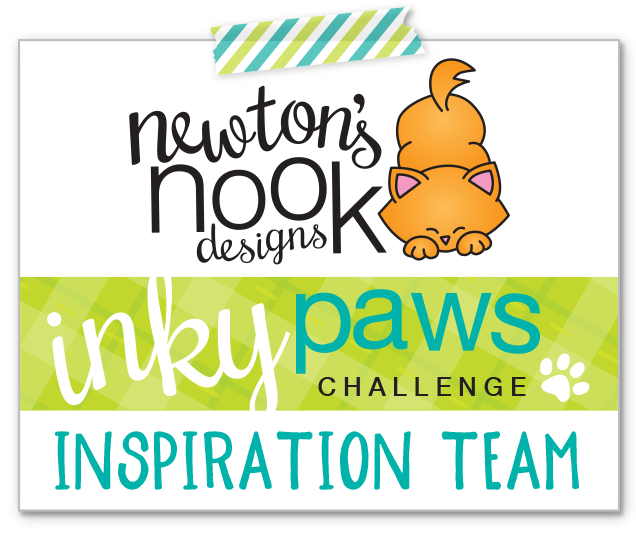 It is inspired by the Newton’s Nook Designs Inky Paws Challenge #41 (colour challenge). I started with stamping the beautiful floral image and sentiment from the Garden Starter stamp set on Bristol Smooth cardstock. I used MFT hybrid ink as I wanted to colour with Zig Clean Color Real brush pens this time. I used only 5 pens: 2 pinks, 2 greens and one yellow. The trick was that I blended them together with a Wink of Stella clear glitter pen. I saw Jennifer McGuire doing it and I wanted to give it a try. It looks so beautiful in real life! I cut the panel with a Pretty Pink Posh scalloped border die and cut a strip of pastel yellow cardstock with Lawn Fawn Picket Fence die. I also used a Pretty Pink Posh die to cut that cute paper bow, it adds so much to the design. The last thing I cut was the smile word die which is from the Newton’s Nook Garden starter die set – I used it on an aqua coloured cardstock. When assembling the card, first I adhered a springy pink striped patterned paper from my stash to a top folding card base. I used 3D foam tape under the watercoloured piece to add more dimension. No sequins this time, just a drop of glossy accent in the middle of the flowers. 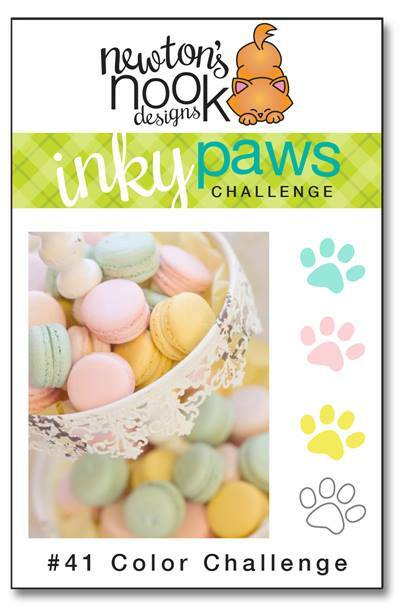 I will upload this card to the above mentioned Inky Paws Challenge. I wish you feel the spring coming when looking at this card. Check back soon please, I have some cute cards done waiting to be blogged. I was busy crafting lately and as I promised myself, I will try to post most of the cards I make so you all can see and be part of my creative journey. The below card I made for a good friend of mine. I stamped the image from the Bon voyage set from Your Net Stamp on marker friendly paper and coloured in with Shinhan and Altenew alcohol markers (I love these, so good quality). I die cut a circle and several stitched circle frames (2 white and 1 red) using Lawn Fawn dies. 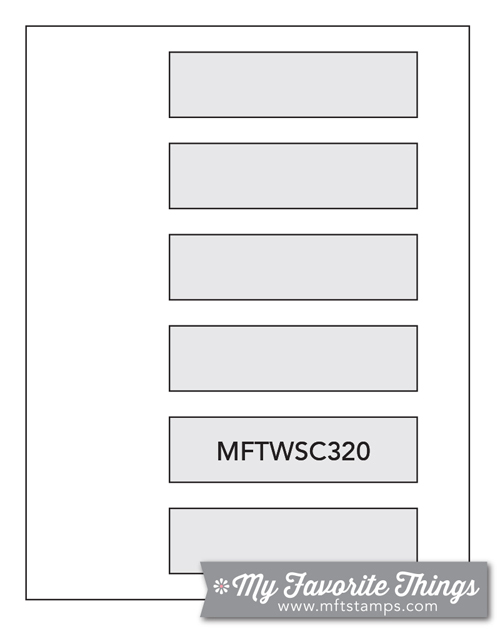 I also die cut banners from the MFT Blueprints 25 die set, white and blue. I used the A2 stitched rectangle from the same set to cut my patterned paper. I white heat embossed the sentiment from the MFT Essential sentiments set on the blue banner and glued them to the back of my circle . I used a grid paper for even spacing, then I adhered all to the background. As embellishment I made my own metallic looking charm by layering several white die cut anchors (retired MFT set) and a silver metallic foil one on top. I added natural twine bow to the top of it. A little Spectrum Noir shimmer and a generous amount of glossy accent finished this cute birthday card. I hope you like it and will check back soon. I started with an A2 sized white cardstock piece and ran it through the Big Shot machine with a stitched background die from Lil’ Inkers Designs (this is my favourite). I had a small piece of a green gingham patterned paper, I cut a strip using the rectangle die in Blueprints 25. I also cut a strip of silver glitter cardstock and adhered those 2 to a scrap piece of white cardstock to be a bit thicker. I stamped a sentiment from the Sentiment Essential set on the gingham strip with black ink. Then using a stitched scalloped circle die from MFT I cut a blue violet piece, a slightly smaller vellum circle and a white double stitched circle. This last one I stamped with the flowers and leaves from the Build-able bouquet stamp set using some simple masking and coloured in with Shinhan alcohol markers to match the colours of cardstock and patterned paper. 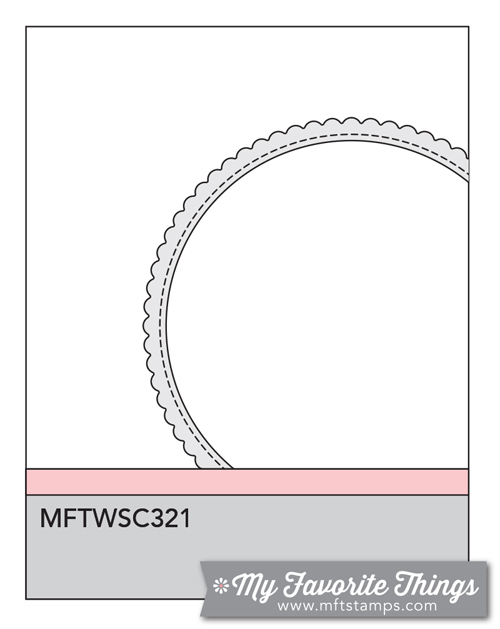 I adhered the layers and cut some parts of the circle piece in order to adhere it to my background like a die-cut inlay. As a finishing touch I added some Spectrum Noir clear shimmer to the petals and a bit of glossy accent. I also decided to tie the silver glitter paper more to the design by adding 3 silver sequins. I will submit this card to the MFT Sketch Challenge #321 and to the Simon Says Stamp Anything goes Wednesday Challenge. I hope you like my card and will pop in soon again for more inspiration. I am just popping in with the second card I made with the same bike – just this time I made it really girlish. Meaning totally pink. I started with creating a distress inked background. I added spun sugar, picked raspberry and wilted violet distress inks with a mini ink blending tool on Bristol Smooth cardstock. Then through a scattered heart stencil I added more of the same inks. Then I shifted the stencil and applied clear sparkle glitter paste. I set it aside to dry, meanwhile I stamped and coloured my images from the Beautiful ride stamp set (SSS). I used Shinhan markers and after die cutting them with the coordinating dies I glued them on the distress background. 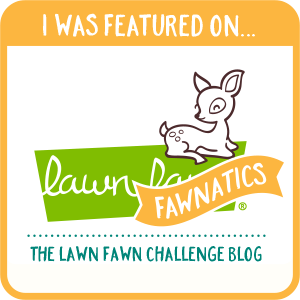 The sentiment is a die cut (Lawn Fawn). After assembling the card I added some clear shimmer with Spectrum Noir shimmer pen and glossy accents to the bike. I used a black glaze pen on the eyes and noses of the critters and glued few tiny pearls in the middle of the flowers. I will submit this project to the Simon Says Stamp Monday Challenge: Transport it and to the Simon Says Stamp Wednesday Challenge Anything goes. See you tomorrow with another fun card. Today I brought you an idea of how to use the same stamp/die set to create 2 different birthday cards for him and for her. First I stamped the images from the Simon Says Stamp Beautiful ride stamp set on some marker friendly white paper. I coloured with Shinhan alcohol markers and used the coordinating dies to cut them out. For the bike I also cut another 2 layers using simple white cardstock and layered them under my coloured image. I wanted a simple look with dimension so I cut a light blue and dark grey stitched rectangle (SSS die) and a strip of light grey cardstock with a Lawn Fawn Picket fence die. I pieced them together on a white card base and glued the light grey stitched strip on top. I heat embossed a Hungarian Happy Birthday sentiment (Scrapfellow) with black sparkle embossing powder. Then I layered the images some flat, some popped up with 3D foam squares. I used the Spectrum Noir clear shimmer pen, a black glaze pen and glossy accents to emphasize some details. I will play along with the Simon Says Stamp Monday Challenge: Transport it! and Simon Says Stamp Wednesday Challenge Anything goes. I hope you like this card and will return soon. Next time I show you the girlish version of this card. A biciklit és kiegészítőit fehér alkoholos filcet jól tűrő papírra pecsételtem (én a Pantonban veszem, kicsit selymes felületű, 25 Ft/ A4 a 250g-os verzió). Shinhan markerekkel színeztem és kivágtam a hozzáillő vágósablonokkal (Simon Says Stamp). Egy öltémintás téglalap sablonnal vágtam egy világoskék és egy sötét szürke téglalapot, valamint egy vékony csíkot világos szürke kartonból (ehhez egy sablont használtam, de lehetne ez egy sima vékony csík is). Fehér képeslap alapra ragasztottam ezeket, majd a Scrapfellow-tól származó feliratot Versamark átlátszó vízjel tintával pecsételtem a job felső sarokba. Erre fekete csillámos domborítóport szórtam és hőlégfúvóval megolvasztottam. A nyomdázott elemeket felragasztottam kétoldalas ragasztóval illetve 3D ragasztó kockákkal. Még egy kis átlátszó csillámos toll, fekete glaze pen és glossy accent, hogy kiemeljek egy-két részletet és kész is a fiús képeslap. Remélem tetszik és hamarosan újra benézel. Legközelebb a lányos verziót hozom. I hade a beautiful floral background I made earlier using an MFT background stamp, white embossing powder and distress inks. I stamped and black heat embossed the sentiment on the bottom (MFT Essential sentiments). I took a small rectangle die and cut it five times from scrap paper. I placed them on my floral background as I wanted (I used a T-ruler for exact placement) and temporarily adhered them down. I put the rectangle die on the little rectangles and ran it though the Big Shot machine one by one. In this way I got the five windows perfectly placed. I glued a piece of plastic on the back and made my tunnels for the micro beads using 3D foam tape. Before removing the release paper I treated the edges and the acetate with an antistatic tool. Then I removed the release paper and filled each window with one colour of micro beads (Queen and Co). It took a while and I had to remove some naughty ones which got stuck on the adhesive tape. Maybe next time I will try to fill first and then remove the backing paper. When it was full, I placed carefully a white rectangle piece on it to close it. My card base is black this time for more contrast. I will submit this card to the above mentioned MFT Sketch challenge and SSS Wednesday Challenge Fantastic florals too.